This week's hot rumor: A Macintosh Tablet computer. No specifics, but if it offers the same features as the MacBook, count me interested. As for rumors of a 17" widescreen display from Apple, count me skeptical. Apple left the low-end (sub-20") LCD market a long time ago, and only huge levels of Mac mini sales could prompt them to return to that part of the market. The Photoshop Ninja reports that Apple has improved Rosetta in OS X 10.4.8 to the point that Photoshop benchmarks average 35% faster on Intel Macs. That could help a lot of Photoshop users transition to Intel before Adobe releases a universal binary of its flagship product for the Mac. In other news, Computerworld looks at Spaces, Apple's virtual desktop technology that will appear in Leopard, and Adesso has a compact $30 USB keyboard just for Macs. Mac Tablet Mac with Docking Station in 2007? "It's no secret that I'm a big fan of the concept of an Apple tablet. It would be a great machine for commuting, allowing me to keep up with news and email on-the-go. New reports indicate that Apple may be close to releasing such a beast in 2007. "Citing sources in Taiwan Australia's Smarthouse [below] claims that Apple researchers have built a fully working prototype of tablet Mac and three companies in Taiwan are bidding for a potential launch in mid 2007." Link: Apple Tablet Coming Soon? "Apple researchers have built a full working prototype of a Mac tablet PC and three Companies in Taiwan are now costing a product for a potential launch in mid 2007. "Sources in Taiwan have said that the focus has been more on the home and the education environment than the enterprise marketplace. Several months ago I was told that Apple was exploring a neat new device that is basically a touch screen that links to various source devices including a brand new media centre that Apple is planning to launch next year. "The Mac tablet has been designed to handle third party applications such as home automation software that will allow users to control lighting, audio, entertainment devices and security feeds. It also acts as a full blown PC has wireless linking for a new generation of Wireless Hi Fi speakers that are currently being tested by Apple." Link: Apple Mac Tablet PC with Docking Station in 07? "It seems like the wait for a native Intel based Mac OS X version of Photoshop, due for release sometime next year (rumored to be around Easter) has just been made a whole-lot sweeter with a new Apple Mac OS system update. "Reports suggest that by upgrading your operating system to 10.4.8, you will get around a 35% speed improvement...."
"Last month, I talked about Time Machine, the revolutionary backup tool that will be built into Mac OS X 10.5, or Leopard, the next release of Apple's operating system that's due out early next year. Although Apple has been mum on many of the details of Leopard, CEO Steve Jobs did preview some of the coming attractions back in August. This month, I'm looking at another of those new features in Leopard that has gotten a lot of attention - and engendered a fair amount of informed speculation - among Mac fans: Spaces. "Simply put, Spaces creates virtual desktops. A virtual desktop acts like an imaginary second display, allowing you to position a number of windows among various virtual desktops. You can also switch between them, in effect turning your head to look at a different 'physical' screen. "As with using multiple displays, the advantage of virtual desktops is that you can organize the various applications and windows that are displayed at any given time without closing them or minimizing them to the dock. You can still have windows from a dozen applications open - but you're not distracted by all of them overlapping each other...."
"LCD vendors such as ViewSonic and Apple are set to launch 17-inch widescreen LCD monitors by year-end or the first quarter of 2007, according to industry sources. "LCD monitor vendors expect 17-inch widescreen monitors to replace entry-level and middle-range 15-inch and 17-inch LCD monitors in the future. The prices for 17-inch widescreen monitors will not necessary be higher than 17-inch 4:3 models amid more efficient panel cutting by makers, according to the vendors." I've just updated my top picks of Macintosh photo editors. Whether you're just starting out, in need of something more advanced, or have a restricted budget, you're sure to find something that meets your needs. PR: The Adesso Mac SlimMedia Mini keyboard for Mac takes its inspiration from Apple's distinctive, contemporary approach to design. 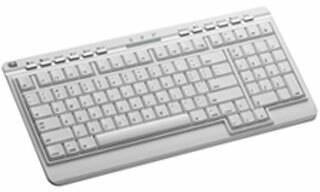 Inside its low-profile form, the keyboard is packed with performance and convenience functions. Low-travel, high quality membrane key switches delivers a crisp, responsive touch for faster typing. And multimedia hot keys provide intuitive, one-button control of audio playback & web browsing. PR: Supports Multi-stream Uncompressed SD, DV, HDV, and DVCPro HD - available in 500 GB (standard), 1 TB and 1.5 TB capacities. Introducing the first configurable FireWire RAID solution supporting uncompressed 8-bit/10-bit SD editing and photo libraries. 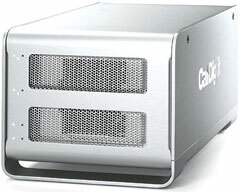 The FireWireVR is equipped with 2x SATA 3 Gb/s hard drives and CalDigit's unique FireWire technology to support multi-stream uncompressed SD, DVCPRO, HDV and DV nonlinear video editing systems. FireWireVR is also designed to store large photo libraries with an option of providing hardware RAID protection on digital content. Each rugged & functional aluminum enclosure incorporates a high airflow cooling system. A quiet, reliable, ball-bearing fan and specially designed venting facilitates airflow above and below the hard drives from the front of the unit to the back. solutions that may have RAID functionality but fail to deliver when a mirrored drive is down. The FireWireVR product has real swappable functionality, which enables a dead drive to be swapped out, replaced and rebuilt. The FireWireVR also features the latest SATA 3 Gb/s 16 MB cache drives for speed to meet the demands of the most up-to-date video & content editing software. PR: MaxConnect for Mac Pro is an internal hard drive mounting solution that allows four additional SATA hard disk drives to be installed in the optical bay of the Mac Pro system. MaxConnect for Apple Mac Pro Optical bay internal hard disk expansion solution allows Mac Pro system to utilize two extra SATA data channels (available on the logic board) along with existing Optical Drive, MaxConnect flexible design allows Mac Pro system to house eight hard Disk Drives internally. Two piece construction, Precision machined Aluminum. Slip in Design in the Optical Bay, no modification needed. Surface Treated for electrical insulation. Install two SATA drives in the Optical Drive bay with the Optical drive (Optical Drive with 6 total SATA drives, on board SATA Channels No SATA Controller required). Install two SATA drives in the Optical Drive bay with an ATA/IDE Drive (7 total internal SATA drives: No SATA Controller required). Install four SATA drives in the Optical Drive bay (8 total internal SATA drives: Two internal ports SATA Controller required). Six SATA drives installed in the Mac Pro system, two SATA drives in the Optical bay along with the Optical Drive and four in the factory bays, two SATA drives in the Optical Drive bay are connected with two onboard SATA channels (All six drives have native SATA support), user can stripe all six drives for maximum DATA transfer rate,or stripe two drives in the Optical Drive bay for faster boot (2x WD Rapter 10k) and stripe four drives in factory drive bays, or any other combination desired. Eight drives installed in the Mac Pro system,Four SATA drives in the Optical bay along with four SATA drives in the factory bays, two SATA drives in the Optical Drive bay are connected with two onboard SATA channels, (requires removal of Optical Drive, mounts on the same Optical drive mount), (Six SATA drives have native SATA support two SATA drive in the Optical Drive bay connected via two internal ports PCI Express Controller) , Eight drives striped for maximum DATA transfer rate (470+ MB/sec) . Seven drives installed in the Mac Pro system, two SATA drives in the Optical bay along with four SATA drives in the factory bays, two SATA drives in the Optical Drive bay are connected with two onboard SATA channels and one IDE/ATA Drive in the Optical Bay ( requires removal of Optical Drive, mounts on the same Optical drive mount )(All six SATA drives have native SATA support and ATA/IDE drive is onboard IDE channel (native) , user can boot from an IDE/ATA Drive and stripe all six drives for maximum DATA transfer rate. Westshore Craftworks, makers of the iDockCover, is excited to make a couple of announcements. We have some new products and a new web site. 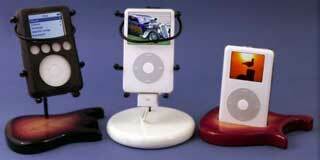 First of all, we have the new GS Series iPod stands. Inspired by a guitar stand, they feature a lacquered hardwood base with a steel wire bracket that facilitates all full-size iPods. And they work with or without a case! We currently have four different styles - two round bases, one in glossy white lacquer and one in glossy black lacquer. We also have glossy sunburst lacquer guitar base (looks similar to a Strat) and a glossy black lacquer Grand Piano. Secondly, we have a new web site - www.PodStands.com. PR: Audio innovations and enhancements have come in many formats with new jumps in technologies over recent years. What can be done with these technologies for the consumer may be coming into a new light by a new company. iSymphony Holdings Enterprises, LLC has officially announced the launch of its new iSymphony line, designed to integrate these technologies and provide new eye-opening applications of them for the user. Rodney Rich, Director of Marketing for iSymphony, pointed out flatly that "unlike the many 'i' companies marketing products today, the 'i' in iSymphony stands for something other than just riding the iPod coat tails: it represents integration and innovation. iSymphony combines traditional audio needs with unique applications of iPod and contemporary music sharing devices." The market is filled with devices that allow you to play your favorite iPod tunes via a dock and speakers, but do not allow you to do much else. 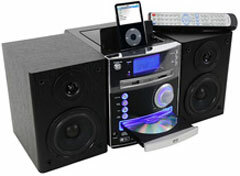 CDs, your favorite radio stations, and staple functions of traditional audio systems seem to have been forgotten. iSymphony has integrated these functions and many others into its unique products along with the iPod "playability." One flagship model in the line, the M1 (available at Best Buy, Radio Shack, CompUSA, Fry's Electronics and many notable retailers across the U.S.), has an integrated CD/MP3 player, USB, SD/MMC inputs for flash memory devices to be played through the unit, an AM/FM stereo tuner, MP3 and WMA playback, a backlit clock with "wake up to your favorite music" functions, and caps it all off (literally) with a built in universal dock for iPod with adapters for all docking iPod models included. The system allows your iPod to charge while docked, and with the M1's PC connectivity, allows you to remix your tunes through the system! Oh - for the iPod shuffle owners, fear not; just plug your unit into the USB port and enjoy the very rich sound the M1 provides. The unit's sound quality is superb, and is enhanced by Dynamic Bass Boost and preset EQ settings. Need more? The iSymphony M2 takes all of the M1's features and adds a Progressive Scan DVD/MPEG4 player plus additional flash memory via its Memory Stick compatibility. 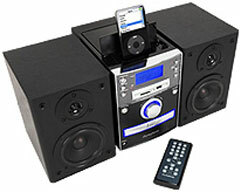 The result: a DVD/Home Theater/iPod system that appeals to every member of the family, whether at home, office or dormitory. It is the ultimate "all-in-one" system. The company seems to have thought of everything: you can even take your SD card from your digital camera, plug it in to your M2, and have a home slide show on your large screen TV. The unit plays your iPod videos on your TV, too, showing all relevant information regarding the artist, song number, etc. The iSymphony line features products that incorporate iPod functions and docking/charging stations in micro systems, clock radios and other product categories. There is no skimping on sound quality, either, as the speakers, amps, and power of the iSymphony systems provide rich, high fidelity sound. Mr. Rich cited the impressive retail account roster that picked up the line immediately upon its inception, and also pointed to prominent chains abroad that similarly picked up the products as soon as they were deliverable, most notably Dixon's, the largest electronics retailer in the U.K. and Europe. Rich attributed the immediate pickup of the line to its novel applications, noting that the company's marketing and R&D staffs saw market conditions that allowed for simple integrations that would have mass appeal and start "a migration from iPod speakers with no functions to integrated and loaded 'hybrid' units that would also revive flat audio system categories worldwide. Once this occurred to the team, the direction and focus of the company immediately crystallized; what you'll see from iSymphony in the very near future will take great existing technologies - including Bluetooth and WiFi - and utilize them with simplicity and sensible applications that bring great convenience to the consumer." Rich went on to add that the company will be showcasing these technologies in its new line of products at the Consumer Electronics Show in Las Vegas in January. He stated that "The Company will maintain its iPod integration with new twists to it, while looking to broaden our demographic reach to the widest degree possible with products that are perfect for any member of the family in any setting. I believe that it will be difficult for anyone to find mainstream categories of product with features that rival the level of innovation we'll be unveiling." 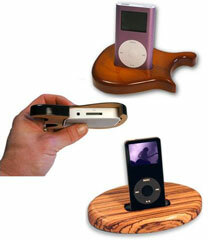 Most products under the iSymphony line up are part of the "Made for iPod" program. This program designed by Apple allows for companies such as iSymphony to state "Made for iPod" on POP materials, as well as on the packaging of products that have been authorized by Apple to use their proprietary dock connection within. iSymphony is very proud to meet the high expectations of Apple under this program, and, as Mr. Rich concluded: "This is only the beginning." iSymphony Holdings Enterprises, LLC is a privately held company incorporated in Los Angeles and is in the business of making audio devices integrating and creating new applications for the latest technologies.